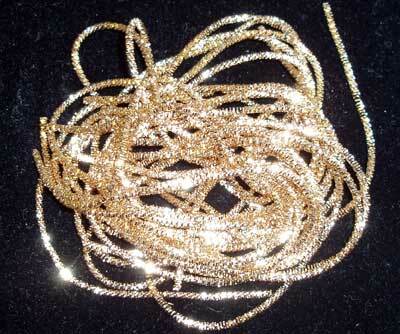 You already know I have an inordinate love for threads – I think I should probably see someone about that – but you might not know that I am especially infatuated with gold (real metal) threads. Today, thanks to JoWynn’s generosity, I’m going to show you some upclose photos of Sadi thread. I haven’t had a chance to actually work with these threads, although I have handled them, examined them, stretched some a bit, and lined them up next to other gold threads in my stash. 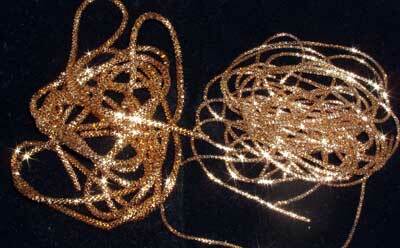 Sadi threads are metal threads that are very much like some of the European goldwork threads. 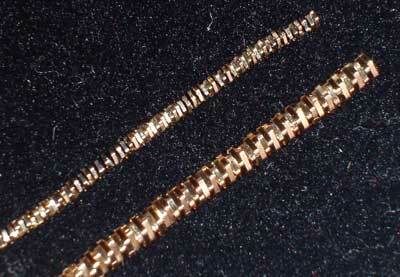 Specifically, the Sadi threads available on the market now are similar to smooth purl, check purl, and pearl purl. If you aren’t familiar with metal threads, there are two really good sources of information out there that will help you distinguish types of metal thread: Tanja Berlin’s metal thread glossary, and the Benton & Johnson website. So let’s take a look at the Sadi threads available. These are distributed by Rajmahal, out of Australia, who also produce Rajmahal Art Silk, which is a thread made up of silk and viscose. Rajmahal produces several types of Sadi threads. We’re looking at their check, smooth, and pearl. The threads come (from what I can tell) in only two sizes, fine and broad. This is a pile of fine check – you get this much in one of those little cannisters. It’s quite a bit of metal thread! And this is broad check. The broad and the fine are actually both the same color – the camera picked them up differently. The stuff certainly sparkles! You can see here the two sizes side by side. 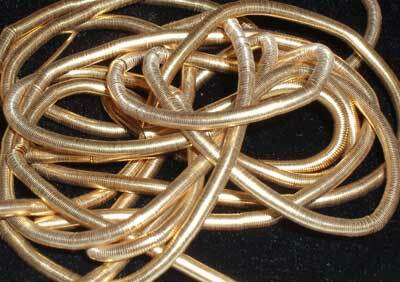 If you’re familiar with European metal threads, this thread would be somewhat like check purl, but not exactly like it. 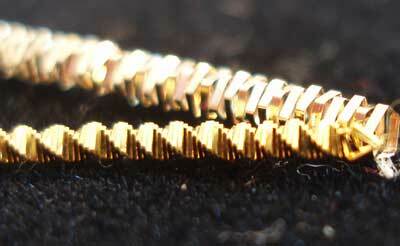 The shape of the metal thread is definitely different, but the effect achieved in stitching would be similar. These are the two side by side in a heap – when you purchase the threads in the pre-packaged cannisters, you receive less, length-wise, of the broad check. Here, I’ve placed a piece of European check purl in front of the Sadi thread, so you can see the difference in the way the thread is twisted. 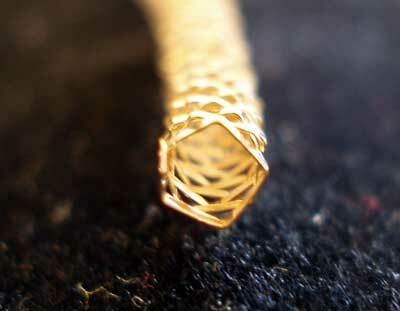 The Sadi is much more like a straight tube, which the European metal thread twists around. 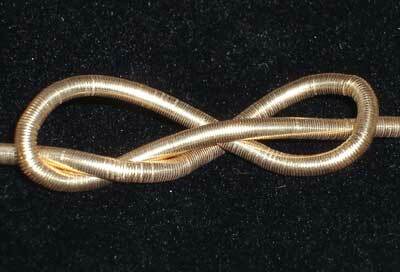 Here, I’ve stretched out both threads so that you can see the shape and twist. Sadi is also available in smooth (purl), which is much like the European smooth purl, although I think the wraps are a little more visible on the Sadi thread than on the European thread. Smooth purl is like a closely wound spring, and, when you hold a quantity in your hand, it is limp and kind of “wormy.” It’s neat stuff! Like the check Sadi, the smooth said comes in two sizes – the photo above is broad smooth Sadi, and the one above that is fine smooth Sadi. You can see them both side by side here – the broad is really fat and worm-like! Like the check Sadi and purl above, the smooth is a hollow tube that you cut and sew on as you would a bead, though it is much more flexible than a bead! 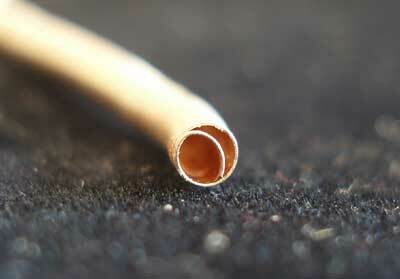 In fact, you can see how flexible it is here – this came out of the cannister this way! And finally, here’s the pearl Sadi. This thread is a whole lot stiffer than the other two. 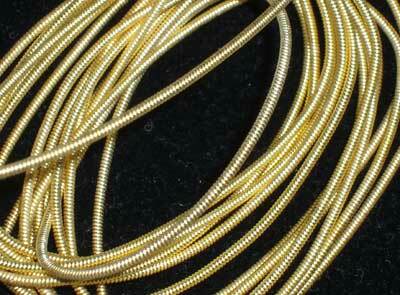 Pearl is used as an outline, normally, and it has a “beaded” or bumpy look to it, unlike smooth purl. The pearl Sadi is a different color, compared to the other two threads, which surprised me. It’s really yellow, as opposed to gold-metal-looking. So those are the three types of Sadi thread similar to European check purl, smooth purl, and pearl purl. 1. There are only two sizes of each type. 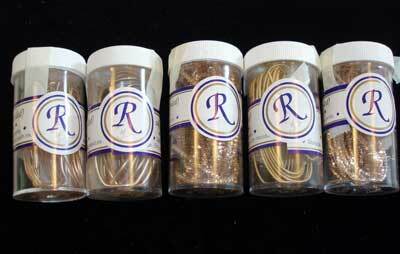 With the European threads, a whole range of sizes is generally available within each type. 2. The check Sadi seems to me to be much lighter than the European check purl in weight. I think this definitely has to do with the way it is twisted. I think there’s more metal used in the European, and the Sadi has a much larger “hollow” in the middle of it. e any gold in them. 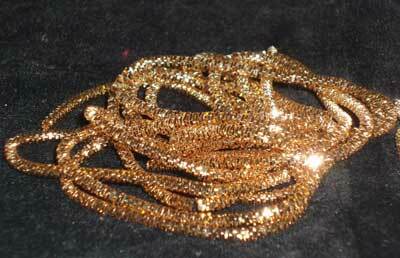 The label does warn that they tarnish (as do European real gold threads), but the tarnish can come from a silver base, or even from some other metal. So I don’t know what they are precisely made of, and neither the label nor the Rajmahal website clarify this. 4. 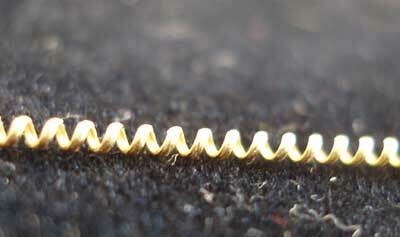 The Sadi threads work the same way that similar European metal threads would work. 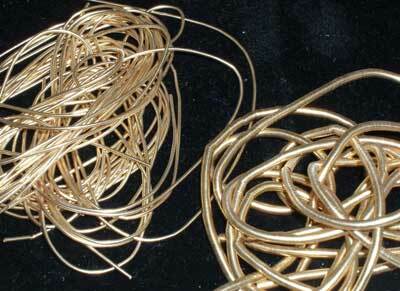 Although you might be limited in what you do with them because of size availability, they are slightly less expensive than European metal threads (even less expensive than gilt as opposed to 2% gold), so it seems to me that they would make very good practice thread, if you want to try goldwork. I was really happy to be able to look at these threads up-close (thanks, JoWynn!). I would like to stitch with them a bit before I offer any firm opinion on whether I like them, or to what degree I like them compared to the gold threads I’m used to. But I do know this – if you want to give goldwork and metal thread embroidery a try, you couldn’t go wrong practicing with the Sadi thread. JDR Brazilian Elegance. Located in North Dakota. Though I haven’t ordered from them personally, this is where my threads came from, and it seems that they are very nice and efficient, with good service. Each cannister is $6.50. A cannister of broad Sadi has 1.5 meters in it, and a cannister of fine Sadi has 3 meters in it. They also carry variety pack cannisters, so you can try the different types of threads. Erica’s. Located in Indiana. This is primarily a machine-oriented sewing / embroidery center, but they do carry some hand embroidery supplies, including the Rajmahal Sadi threads, at $5.90 a tube. I’ve ordered once from Erica’s (two books) and received ok service, but it didn’t remind me of the “local needlework shop” experience. In New Zealand, there’s a shop called Eastern Threads that looks as if it carries a pretty wide range of Sadi threads. I don’t think they’re made by Rajmahal – they have a wider range of colors and it seems they also have a “medium” size available. If you’ve had any experience with these threads, or know of other resources, I’d love to hear about it! Whew! That was a long one. On a personal note, things improve daily, slowly but surely… thank you again for your on-going encouragement and kind words. Wow! You must be feeling better! That was a long one even for a good day! The gold thread is so beautiful. I hope you are going to use your samples to work up something pretty. I would love to see what you do with it. Ooh! Sparklies! I’m glad you’re on the mend, Mary. I do hope you’re taking it a little easy though. I have a feeling you don’t do “taking it easy” very often…but sometimes you just have to, girl! I’ve only used the Rajmahal Sadi threads once, as usually the stock at my local shop has been damaged by people opening it and stretching it out to look at it. 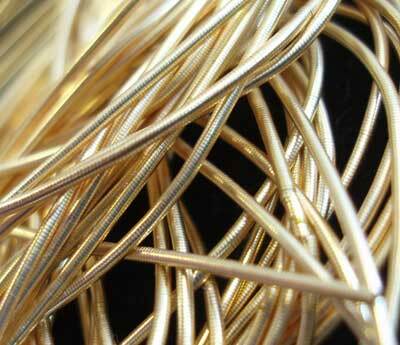 I prefer to use the Japanese or English metal threads which our Embroiderers’ Guild shop stocks for us. I like to buy the best I can afford in materials even when trying something for the first time, or I don’t tend to finish that project. I’m very lucky that I can afford to do that I suppose. Thanks for showing the variety of threads though, my local shop only stocks a couple. I know exactly what you mean about using the right materials, even for the first time, as it helps one push ahead to the finish. I find when I’m working with materials I don’t particularly like, I tend to lag when it comes to finishing (or sometimes, I just chuck the whole thing!). Anyway, they are sparkly, aren’t they, Jeannine? Thanks for another excellent teaching post. I’m glad to hear that you are making progress. Thank you for this article. It’s so good to find pictures like this with so much details. And better than that, I have finally understand because of this article what means “purl” in french (because I live in France). It’s “cannetille”, so thank you! Great article and very informative. I have just seen the new range of coloured Sadi threads from Rajmahal Fabulous, loving the autumn twist and the red/green, gold/silver, green/gold and antique. I get mine from Sewandso.co.uk as they have a reasonable range of Rajmahal. There is a free how to use Sadi brochure to download on the Rajmahal website. Love your website. Always so interesting, thank you! Previous Previous post: Some Shaded Embroidery – What Do You Think?